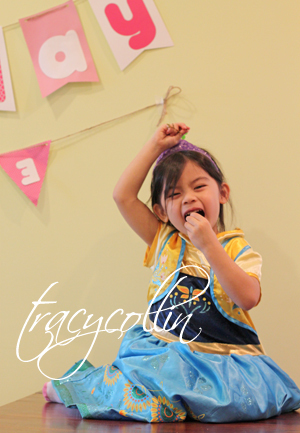 Lovebug loves Frozen and it's no surprise she wanted a Frozen birthday party. She talked about it since after Christmas but we wasn't going to throw her one as Peanut will just be born and our hands surely will be full. We planned to have one just with our family. However after talking about it, C and I really want her to have a her own party (as she probably have to share her next one with Peanut). 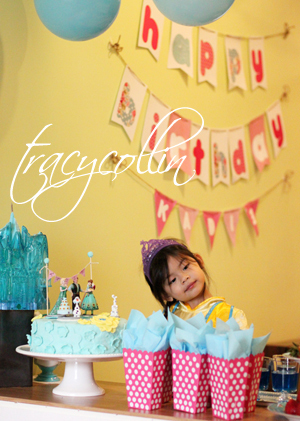 We'll have a low key party and will re-use whatever decorations we have around. Love's been looking forward to her birthday and we don't want to short change her. At 2 they might not know it but at 3, Love has been counting down to her birth date. Love was very specific with her birthday. 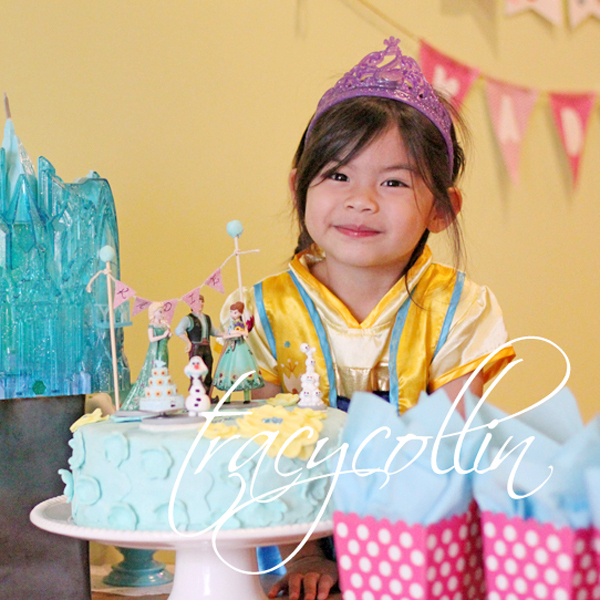 She wants a pink birthday with blue cake with yellow flowers (Frozen Fever) and friends :-) and she wants Frozen characters on the cake. While a cake is pretty to have, our family (minus me) and friends and their kids are not big cake lovers. 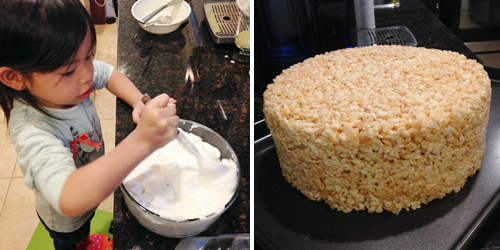 I googled around for home made cake ideas and decided on rice krispies cake for her ! We all like rice krispies so rice krispies it is ! The day before the party, C and Bee put up the decorations. Bee blew over 15 balloons on her own. Such good helper she is ! She also drew a picture of Elsa and Anna and cut them out to decorate the giveaway basket. 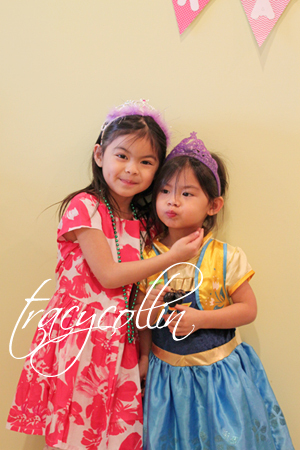 Then she and C both left to attend her classmate's birthday party. Peanut was sleeping so I started on the rice krispies cake ! I used a cake pan to mold the rice krispies marshmallow mixture then covered it with melted white chocolate. The melted chocolate will act as an adhesive to the blue fondant I will be making. The fondant was a nightmare ! my 1st time making it ! The recipe is of mainly melted marshmallow with confectioner sugar (recipe here: http://www.food.com/recipe/marshmallow-fondant-255227, I used butter instead of shortening). It was easy to make however having a new born and a toddler around makes the whole thing mission impossible !!! Needless to say, the fondant didn't turn out the way I planned :-( I rolled the fondant to a good thickness but when pulled up from the board, it thinned out and when it went on the cake, some parts stretched and left holes on the cake :-( and it can't be peel off as the white chocolate held on really tight. Standing back and looking at my lumpy blue cake, I was about to give up ! Then I thought why not patch it up with random flowers. Thank God for the flower cutter !!! 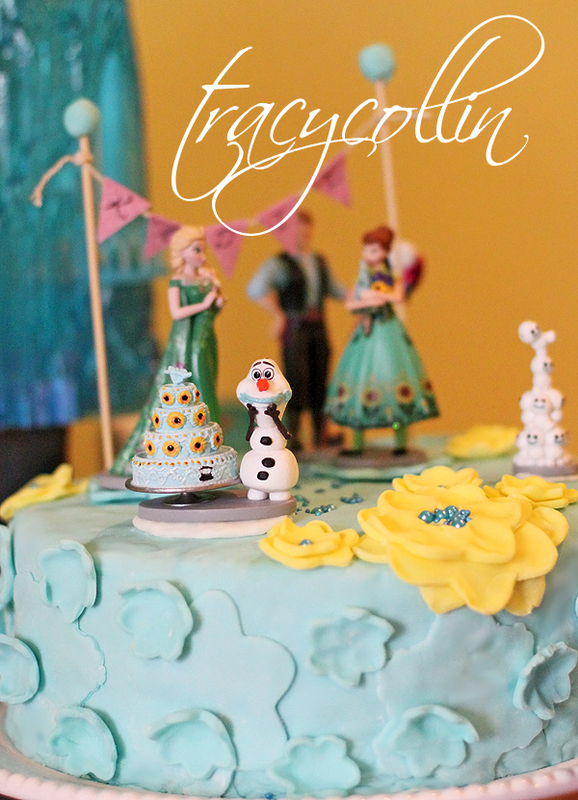 4 hours from start to end, adding some mini Frozen figurines (Disney Store, $17) and the finished cake looked kinda OK ! not what I had in mind, but it will have to do as I don't know how to fix this ! I took Lovebug in the kitchen to show her what I made. When she saw the cake, she squealed and hugged me. She said "thank you for making me blue cake mommy ! It so pretty !". Her words make the whole crazy ordeal worth it ! She was super happy and keeps checking up on it throughout the evening. Seeing her happy makes me feel pretty awesome actually. I'm glad I attempted it. Will I ever do this again ? Probably not. One can never say never though !